According to the AT magazine, a magazine exclusively for the subject of Architectural Technology, in April and July of 2013 there have been the latest changes in the Building Regulations, intending to reduce the burden of regulation in the construction industry, and includes changes to Parts B, K, M and P.
The changes to the Approved Documents to Part B and M are minor, however the changes for the Approved Documents Parts K and P and to Regulation 7 are extent enough to the point that they require new editions of the documents. Approved Documents K, P and Regulation 7 are completely re-written to conform to English standards only, to improve readability and remove duplicate information. Even thought the Approved Documents are simplified there is a downside to this change. Each document is divided in three types of buildings: Buildings other than dwelling and common access areas in buildings that contain flats and do not have passenger lifts, Building other than dwellings and Dwellings. This is a downside as all the regulations have to be read carefully to determine which is for what type of buildings. -A new footnote to Table 10 permits decorative wall coverings which achieve European Class C-s3,d2 to be used in circulation spaces, provided they are bonded to Class A2-s3,d2 substrates, The change is intended is to remove a barrier to the adoption of the European classification systems. -The limitations on the use of type TP(b) thermoplastic diffuses and roof lights have been relaxed to allow smaller units to be used closer together: the revised limits are in table 11 and diagram 27A. It is anticipated that will facilitate energy efficiency lighting layouts. 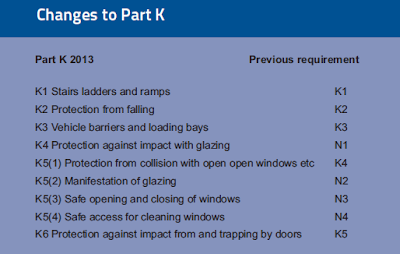 Part K and N are addressed to protection against falling, collision and impact with glazing, while in Part M (Access to and use of Buildings) is referring to some of the same issues, however with conflicting guidance. 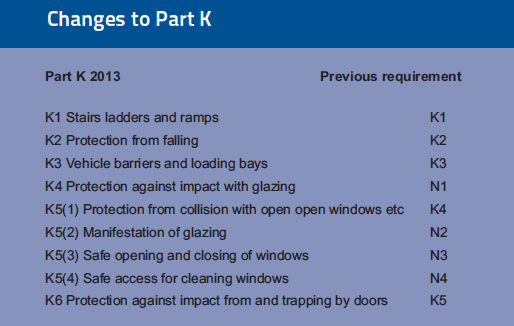 In the new updated version they avoid the repetitive information by transposing all the Requirements from Part N into Part K and avoiding the overlapping guidance from Part M.
This table illustrates the structure of Part K, together with the previous location of the Requirements. The new Approved Document is not intended to provide new technical requirements, but only some minor changes in the guidance. Private: intended to be used only for one dwelling. General access: the normal route between levels for all building users. -The guidance on rise and going has been simplified and, as a result, there are difference in allowable dimensions. -Approved Document K now contains minimum stair widths for buildings other than dwellings, of 1200 mm between enclosing walls or upstands, and 1000 mm between handrails. -References to standards have been updated, so, for example, loading on guarding is now circulated to BS EN 1991-1-1 (with UK National Annex) and BD 6688-1-1. The most significant change that was made for Part M is referred mainly to Access Statements for building control purposes. 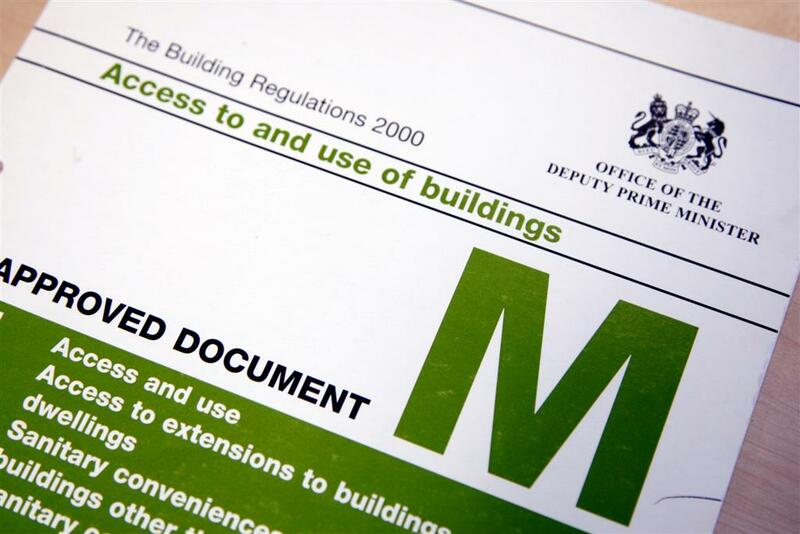 The Building Control Bodies (BCB) did not find Access Statements very useful, and the preparation of Access Statements did not sit easily the design process, therefore it has been abolished. Instead the applicants must communicate the access strategy, which means BCB requires to receive the strategy clearly how the approach chosen for the project demonstrates compliance with Part M.
The access strategy should focus on points where they drift apart from the Approved Document. For smaller project it can also be suggested to have a conversation to review the proposals and record the outcome by correspondence. For larger works it may be required to be provided with written documents accompanied by annotated drawings. The intention of this part is to reduce the number of injuries and fatalities caused by poor quality electrical installation work in dwellings. Part P has been introduced since 2005 which improved the electrical safety, but there have been concerns that the range of notifiable work is too extensive and the cost of inspection for unregistered installers is too high. In these issues is where the changes are focused. Where work is notifiable, a registered competent person can self-certify the wok. Non-registered installeds can either have the Building Control Body certify the work, or they can arrange for third party certification by a registered third-arty certifier, which should be more cost effective. CE marking under the CPR to a harmonised European Standard or European Technical Approval. CE making under other European legislation, such as the Gas Appliances Directive. The Italian fonts indicate the changes that have been made to the Approved Documents.